All transactions are safe and secure with a reliable history in online purchasing behind each of our associates. 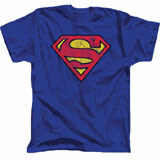 Buy the Superman Distressed Logo t-shirt to own Superman clothing and merchandise. This is hands down the current bestselling man of steel tee. The officially licensed comic book t comes in dark blue. The symbol has a slightly worn or 'distressed' appearance, hence the name of the shirt. Its stylish look is casually fashionable and is ideal for both adults and kids. This cool Superman tee is great for a casual night of fun or a relaxing day at home. In addition to the Superman Distressed Logo tee above, browse the Superman Clothing Gallery for more apparel like men's and women's clothes, kids shirts or hoodies.